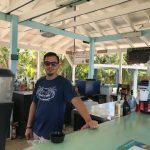 Whether or not the Bahamas are part of the Caribbean can be argued but one thing that we can all agree on is that Sandy Toes Beach Bar, located on Rose Island, is a must visit for any beach bar bum. Come along and get your toes sandy with guest author Shannon Deissig. 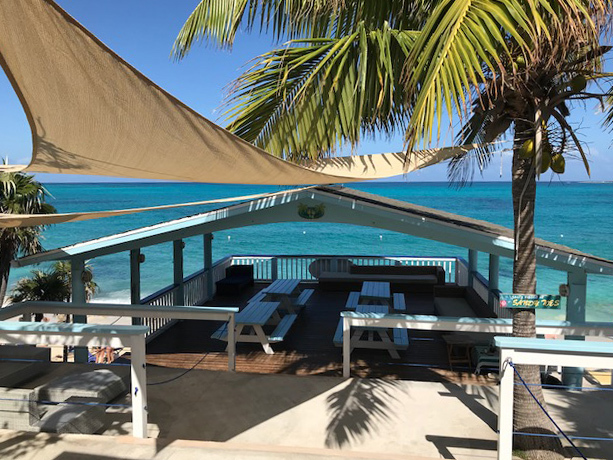 Of course, we all know there is no shortage of beach bars on the islands in the Bahamas. I have visited many over the years. What I had never done until this past visit over the Thanksgiving holiday is take the short boat ride over to Rose Island. Only approximately a 30 minute boat ride from the Paradise Island Ferry Terminal, this gem was worth the trip. Aside from a fairly newly constructed villa for rent, the island is basically deserted. And Sandy Toes is the only company that brings people over to the island, so this avoids the overcrowding, cruise ship passengers, etc. from “ruining” the day. 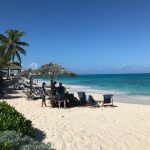 You arrive on the cliff side of the island, but only a short walk up the steps and over the ridge is the Sandy Toes Beach Bar (and gorgeous beach as well). You are welcomed with a complimentary “Sandy Toe” beverage (a delicious concoction of 5 liquors, mostly rum, and perhaps a SPLASH of fruit juice). Then you can enjoy the delicious spirits courtesy of Christian the rest of your day. 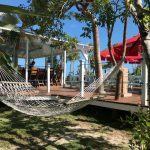 Enjoy the hammocks, bar stools, picnic tables or the gorgeous lounge area which overlooks the beautiful Caribbean Sea. You can also play some corn hole if you’d like right on the side of the bar! 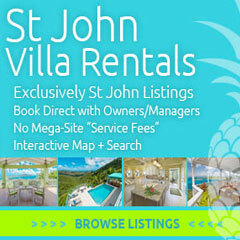 The prices are quite reasonable, which is not always the case in destination locations. The native Goombay Smash is $6.50, with the more “potent” specimens ranging up to about $12.00, which is still reasonable in my opinion for the alcohol content, great service, and unrivaled views. 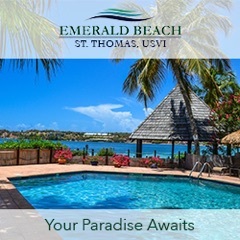 In addition to the enjoying the libations, hammocks and corn hole directly next to the bar, you can snorkel (they have shop right there where you debark), swim with some baby pigs, play beach volleyball or just simply bring a bucket of your favorite beer down to the pristine, which sandy beach and calm waters and just lounge in one of the many beach chairs that are provided free of charge. 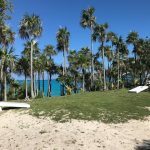 This island, the bar, the staff and, of course, the drinks, were top notch and an experience I would recommend to anyone, whether a first timer to the Bahamas or an old, salty veteran. 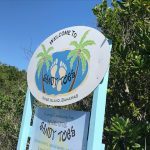 Add this to your “to-do” list when visiting Nassau or Paradise Island, escape the crowds and high prices and enjoy a relaxing, enjoyable day on Rose Island at Sandy Toes. 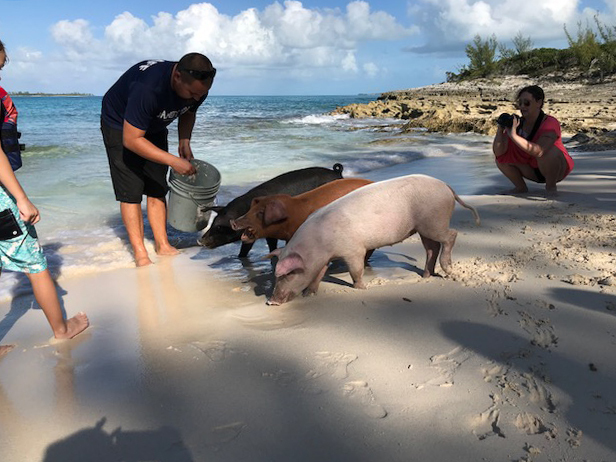 Shannon Deissig has been traveling to beautiful beaches since she was 4 when she took her first trip to the U.S. Virgin Islands. She’s pretty sure she fell in love with the Caribbean and the beach in general at that young age. 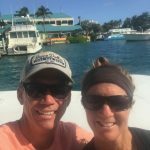 Travel has become a passion throughout the course of her life and she, along with her husband, try to travel to beach/foreign destinations for at least 3 weeks a year, if not more. They love checking out the cultures of each, the food …and of course, the beach bars! Turning this love of everything beachy into a passion, a hobby and perhaps an eventual career has been an amazing journey so far. She looks to share as many of her future experiences with as many people as she can and are interested. If you’d like to contribute to a blog post, please send me an email at info (at) beachbarbums (dot) com. You can write it yourself of just send me a synopsis and I’ll write it. Probably not as well as you would write it but hey, it’s guaranteed to get posted. Either way, I’d love to feature your story!